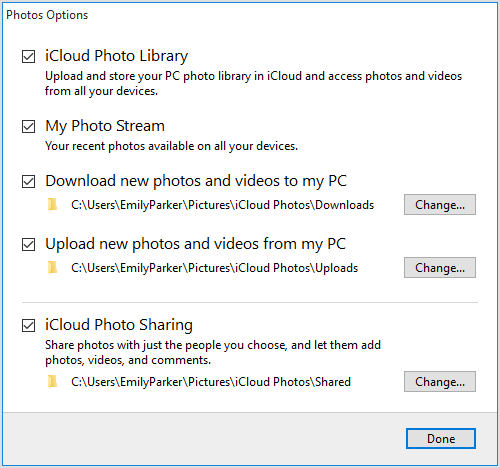 "I cannot figure out how to import my photos from my iPhone to a folder on my Windows PC." Is this statement revealing your situation? If yes, you don't need to think about it again. Exactly, iMyFone TunesMate solves all your 'how to get photos off iPhone to PC' issues just in a click of your mouse. Method 1: How to Get Photos off iPhone to PC with Tunesmate? Method 2: How to Get Photos off iPhone to PC with iCloud? TunesMate, the distinct third-party alternative crafted by iMyFone is exclusively designed to support Window and Mac users with iPhones, iPads and iPods. Not just photos but you can transfer any of your favorite files super easily with TunesMate, that too without thinking about the data loss, deletion etc. So, try it now and get yourself the power to make a perfect hold on your iDevices. 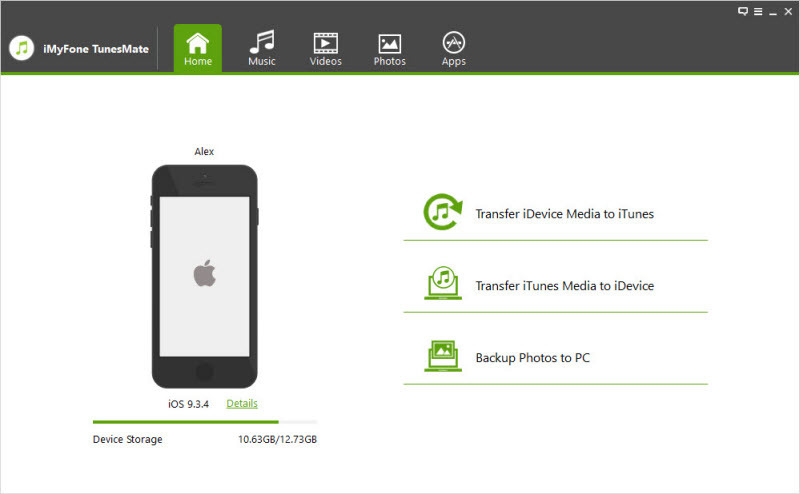 Transfer/sync data in two ways, from your iPod/iPad/iPhone to PC or vice versa. Share your iPhone media and iTunes library freely with your family and friends even if they use a different Apple ID. Get a complete hold on what you transfer with preview and selectively transfer functionality. 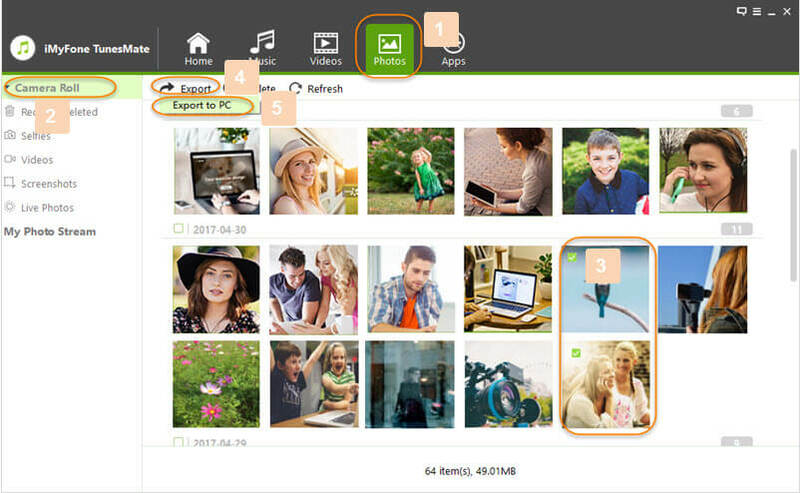 TunesMate gives you 'Backup Photos to PC' functionality that lets you save all your beloved photos in no time. Break the limits that iTunes imposes on its application and enter the all-new range of opportunities with TunesMate. If you wish to get photos off iPhone to PC, TunesMate is the solution for which you have waited for years. Just invest your 1-2 minutes in it and you can master all its features like anything. Just launch TunesMate in your PC and connect your device. Click on Photos, then select any photos from cameral roll, or the album you want to export. Then choose Export>Export to PC. It's simply done! 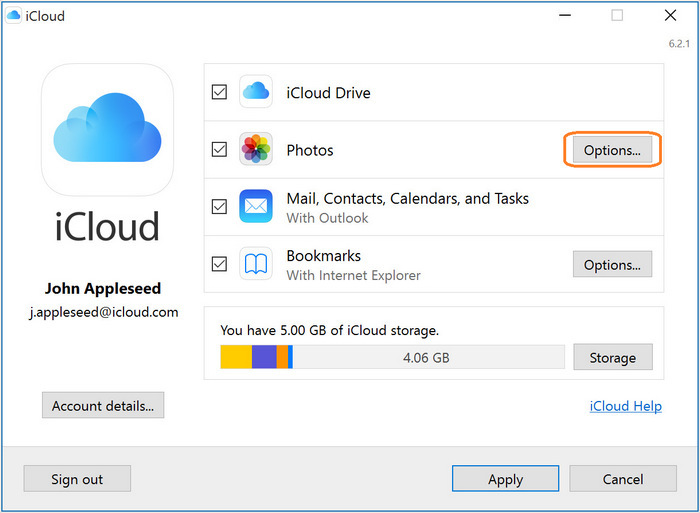 Download iCloud for Windows, proceed to open it. Find Photos and click Options next to it. Now select iCloud Photo Library in the available options. Click Done to freeze your preferences and click Apply to proceed. Backup with iCloud is one of the many options available to get photos off iPhone however you may face issues in saving large files and of course, 5GB of free space will not serve your purpose for long. Additionally, you can't back up until you have a stable internet connection and failed syncing happens a lot. TunesMate lets you get photos off iPhone easily and comfortably. Be it any of the iPhone and any location where you have stored your photos, you can have a perfect hold on all just in a click. No duplicate, no deletion and no data loss, only smoothly organized files! Further, TunesMate works even when you don't have an internet access.